I never thought I would need to use it. All the same, I was quite appreciative, when I was given a small tube of Amodex Ink and Stain Remover, during my last visit to my local Montblanc boutique. This ink and stain remover advertised being able to remove stains from permanent markers to wine to blood to - most importantly - fountain pen ink. Upon returning home, I put away the tiny tube in a drawer with my inks, hoping that I would never need it. Then came the unfortunate stain (see the photo, below). I dropped one of my fountain pens. Not only did I drop it, I dropped the pen, while it was not capped. To make matters worse, it landed first on the crotch of my pants, leaving several spatters of Noodler's Golden Brown ink, before dropping to the floor. 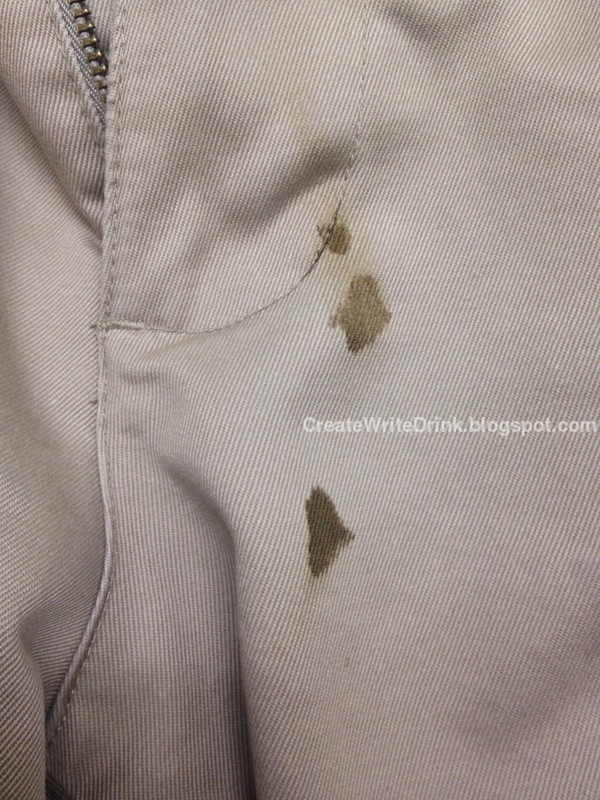 Right away, I knew I had a use and a test for the stain remover. When I returned home, that day, I dug out the tube of Amodex, eagerly reading the instructions...and then proceeded to follow them as best as possible. 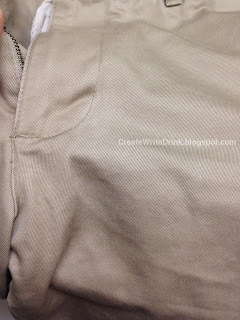 Spreading some of the gel over the stain (as in the below picture), rubbing it with a brush (a toothbrush worked well), while holding a paper towel on the other side of the cloth to catch the removed ink. Through doing so, I was able to remove most of the ink. However, some of the stain still remained. Before washing the pants, I spread more Amodex on the stain and laundered them as usual. See the photo, below, for the results. Well done, Montblanc, for distributing such a good product. I can absolutely recommend Amodex Ink and Stain Remover. This post is unsolicited and uncompensated. I am only a satisfied and stain-free customer. The website for Amodex, here, provides information about locations, where it may be purchased.